Cyprus has two international airports: Paphos and Larnaca. 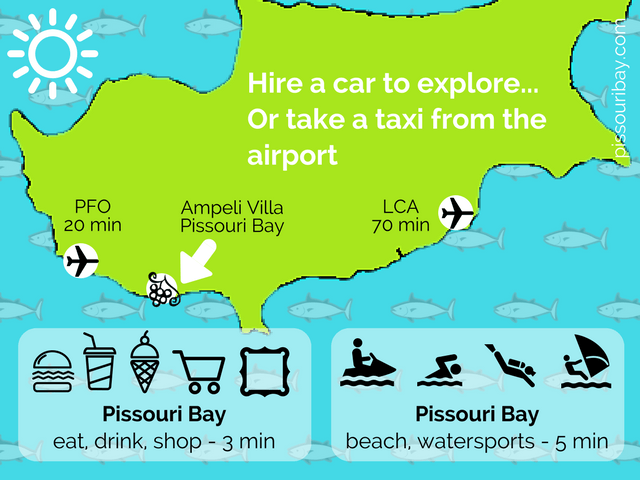 Paphos is nearer to the villa, but if you are hiring a car (rather than taking a taxi transfer), flying to Larnaca is no problem. Paphos (PFO) 19 miles (30 km) – 20 minutes. Larnaca (LCA) 68 miles (110 km) – 70 minutes. Both routes are easy motorway drives. 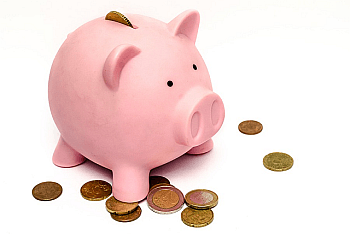 A taxi from Paphos airport is normally €40 – €45, day or night. CTO advice on taxis. 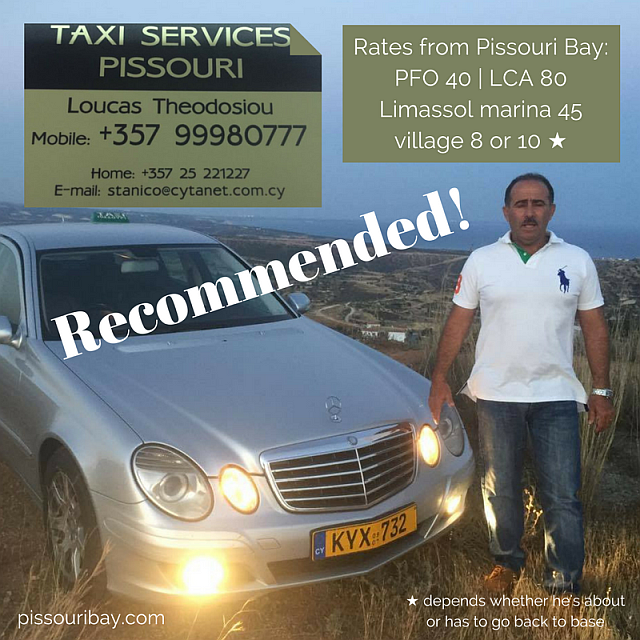 A quick Google will find various pre-booking options, but we recommend our guests contact Loucas Theodosiou or John Pangeras from Pissouri – each offering a regular Mercedes, or a 7-seater. Or check out the comprehensive website of 5★ Trip Advisor recommended Paphos-based Taxi Vangelis. Pissouri Bay has enough facilities to enable you to holiday comfortably without a car. (See Local Maps to help you decide.) 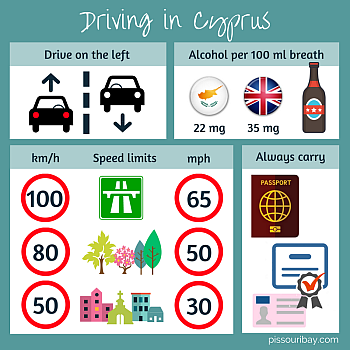 Should you wish to explore further afield, UK visitors will find motoring in Cyprus easy, as driving is on the left and the traffic is much lighter than at home. There is plenty of car hire choice at both airports, and also in Pissouri, giving you the freedom to hire a car for a few days of sightseeing, rather than your whole stay. We have heard good feedback about Cyprus-based Oasis Rent-A-Car. Pissouri company Tarantos Car Rentals has been recommended by guests. To pick up a car at the airport, we recommend using a comparison website such as Which-recommended Zest Car Rental. Alternatives are Rhino Car Hire and Rental Cars. Make sure you avoid the full-empty fuel tactic. We can offer our guests a discount for booking through Zest or Rhino – contact us for details. Saving the worry of unforseen car hire extras, we recommend taking out excess waiver insurance before you travel – see MoneyMaxim. Family-friendly airlines such as easyJet carry car and booster seats free of charge. There are many regional routes between the UK and Cyprus. The busiest days are Sundays and Wednesdays, but daily flights are available. We do not have a set changeover day to allow for flexible arrivals and departures, 10-day stays, etc. Pissouri Bay, (sometimes also referred to as Pissouri Jetty), is 25 minutes east of Paphos, or west of Limassol, along the A6 motorway. About 2.5 miles (4 km) from the larger hilltop settlement of Pissouri Village. 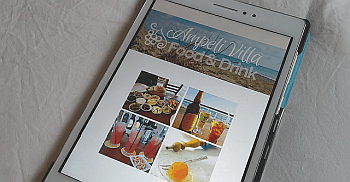 We send maps and directions to the villa from both airports before your stay. Book early: Check airline websites to see when flights are released, register for updates and follow them on social media. Follow us on social media. This is where we share up-to-date airline and travel information, news and offers. Register for alerts: From LowCostRoutes. Be flexible: Consider outbound and return with different airlines. Research online: Compare prices through OTAs (Online Travel Agents) such as Momondo, Skyscanner, Cheap Flights, Travel Supermarket, Thomas Cook and directly with the airline. Travel light: If you can, bring hand luggage only – maybe with easyJet’s low-cost Hands Free option which frees you from toiletry 100 ml limits, as your hand luggage travels in the hold. It also includes speedy boarding. 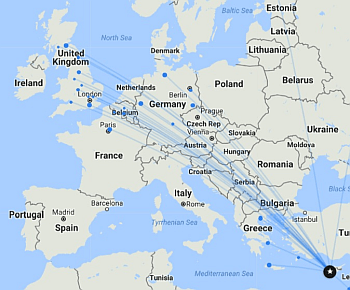 Now click on a departure airport for a pop-up showing airlines and flight days. The arrivals and departures boards at Cyprus Airports can also be used for finding airlines, routes, days and times.